Fire Opal is a stone of luck, abundance, creativity and passion. It enhances intuition and helps you make better decisions by letting you trust your instincts. Fire Opal brings a zest for variety and spices up your life. New business ventures can benefit from Fire Opal by placing one in the cash register or near the front entrance. Fire Opal increases psychic abilities and is an excellent stone for communication with fire spirits and meditating on the four elements. It can increase vitality and sexuality, bringing relationships more passion. Fire Opal also helps one become comfortable with being independent and seeking a new direction in their lives. Physically, Fire Opals aide in blood disorders; ease lower back pain; increase libido and fertility and help ease disorders of the abdomen and liver. Because Fire Opals are relatively soft, and contain a fair amount of water, they should be cleansed in water to keep them hydrated. 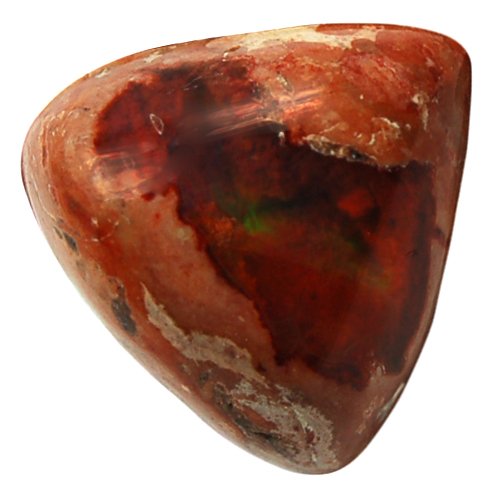 Click here to see Mexican Fire Opal in our online catalog. Question: What fills you with passion?